A SharePoint group is a collection of SharePoint users and is typically dependent on the roles and the necessary permission levels required. 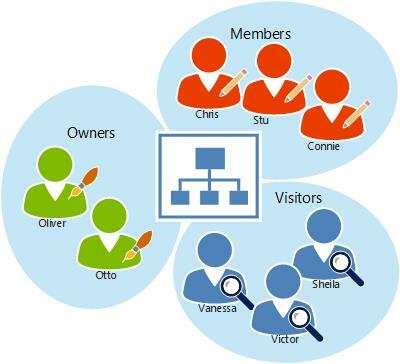 Users can be allocated into any number of groups, depending on the size and complexity of the organisation. Typically, a SharePoint Administrator manages SharePoint groups at the site collection level. By allocating users into SharePoint groups, it makes it much easier to combine users who use the SharePoint site in similar ways. Typically, certain users might need to be able to edit content, others to simply read content and others who might need to be able to add and edit content or other key elements of the site. It is typical for organisations to create different strategies for managing access to different elements of their SharePoint site resources. In schools, there might be a special sub-site where more sensitive data is stored and this may only be accessible by teachers. Another sub-site may be accessible by students as read only, with teachers having full editable rights. The creation and maintenance of SharePoint groups is a manual process. This can restrict the adoption of SharePoint by schools, due to the time and effort required in maintaining the regular user updates. Ruler Connect can automatically create and maintain SharePoint groups at staff, student, year group and class level, utilising the information already held in a school’s Capita SIMS system. Schools can maximise the benefits of SharePoint, knowing that the security and user access issues are dealt with behind the scenes automatically.